The sensitive, inner part of a tooth is called dentin. This living tissue is made of tiny tubules through which sensation is transmitted to the dental pulp. The nerves in the pulp respond to pressure changes along the tubules; in this way they act as a conduit, transmitting stimuli much like an electrical wire. 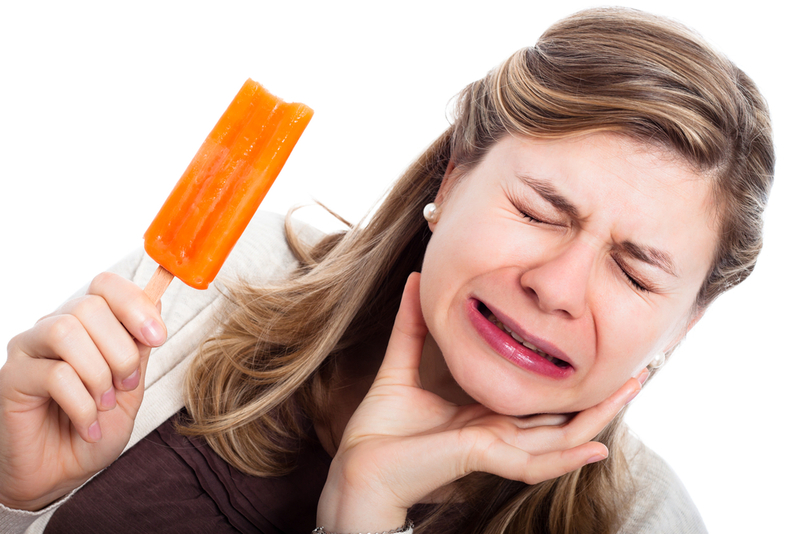 Tooth sensitivity, more accurately referred to as dentinal hypersensitivity, often involves a root surface that has lost some of its cement-like outer layer, known as cementum. This covers the dentin and protects its tubules from coming in contact with substances that could cause pressure changes as described above. But cementum can easily be lost if the root surface of a tooth becomes exposed. How does this happen? Gums can recede (shrink away) from the tooth and expose the root surface. Improper or overly aggressive tooth brushing can cause this. If you have sensitive teeth, show your dentist or hygienist how you brush and the brush you use. They can make sure you’re not overdoing it and that your toothbrush isn’t too hard or worn. Another major factor that contributes to dentinal hypersensitivity is erosion. People with sensitive teeth often have excellent oral hygiene, suggesting that sensitivity is not related to dental biofilm (plaque) buildup. However, exposure to acids seems to play a significant role. 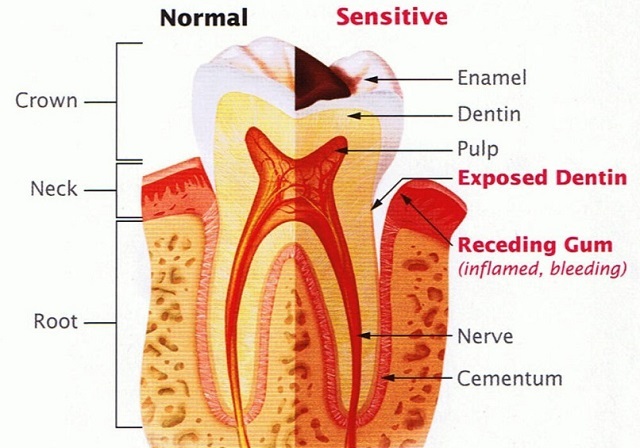 Erosion, the chemical dissolution (breaking down) of tooth structure in the absence of biofilm, is caused by either intrinsic acid (produced within the body, such as gastric acid reflux), or by extrinsic (outside) acid sources: foods, fruits, sodas and other beverages either natural or artificial. Either way acids can demineralize exposed dentin. Tooth brushing immediately following an acid attack can result in a dramatic loss of dentin when this softened tooth material is most vulnerable and weakest. Therefore, you should refrain from brushing for an hour after acids come in contact with your teeth. By then your saliva will have neutralized the acid, allowing the tooth material to re-harden. Saliva and its components can neutralize and buffer acids in about 30 to 60 minutes following exposure to these harmful substances. Rinsing your teeth with water can aid this process. In addition, saliva can dilute and help remove erosive agents. Acidity and alkalinity are measured in pH units from 1 – 14. The mouth is generally neutral, at level pH 7. Dentin has a critical pH of approximately 6.0 to 6.2 below which dissolution begins. Thus, saliva has a critical role not only in preventing teeth from losing minerals (demineralization), but also in bringing minerals back to the teeth (remineralization). The pain of dentinal hypersensitivity can be addressed by either reducing the sensitivity of the nerves in the tubules, or by blocking the tubules themselves. There are many products available for use at home or in the dental office. Each product has a unique chemical composition and method by which the tooth is desensitized along with the necessary building blocks to encourage remineralization. All fluoride-containing toothpastes help reduce sensitivity to some degree. The addition of fluoride has the added benefit of remineralizing and hardening tooth structure; fluoride incorporated into tooth surface structure lowers the pH at which dissolution occurs. Toothpastes containing 5% potassium nitrate or potassium citrate have both demonstrated clinical efficacy, though the effects vary. It is thought that potassium has an effect on nerve action. Potassium-containing toothpastes are also available with fluoride, and have also proven helpful to varying degrees. Some agents function purely as mechanical barriers to painful stimuli. Concentrated fluoride in a varnish applied by your dentist is the one most frequently used. Stannous fluoride and sodium fluoride gels are also effective. Bonding agents and sealants are also used to mechanically block the dentinal tubules. Dentin bonding agents physically enter the tubule spaces and form a physical bond with the dentin, barring noxious agents. Lasers are also used to treat dentinal hypersensitivity, though more research is needed to prove their effectiveness. Since saliva is so important in combating sensitivity, your dentist might recommend one of several products available to enhance your saliva’s protective and remineralizing properties. These include toothpastes containing high concentrations of fluoride, up to 5,000 parts per million (ppm), used for both remineralization and treatment of sensitivity, available by prescription. Others that you can use at home contain various forms of additional calcium and some polishing pastes used in the dentist’s office contain amino acids associated with remineralization; they are generally not available over the counter. Dentinal hypersensitivity can have multiple overlapping causes, so you’ll need to have a detailed discussion about your sensitive teeth with your dentist before undergoing any course of treatment. After conducting a thorough examination, your dentist will be able to diagnose exactly what is causing your sensitivity and develop a personalized plan just right for you.